President Paul handed over the reins to incoming President James Hamilton at a top night. Past President Paul outlined the work that he and the club had achieved through the year and made special mention of the great successes. All in all there was $178000 donated which shows just how important Rotary is to the community. His full report will appear soon on the website. Our special guest was PDE Bruce Barber who responded to the Toast to RI. He was accompanied by his wife and E Club member Ruth. David Benn entertained us with his rendition of poetry. He read a sobering work from a contributor to a website he frequents which spoke of the battle some fight with mental health, and then lightened it up with the painful story of a man and his plastic chair! Both were very well received and brought tears to the eyes in more ways than one. Another highlight of the night was the presentation to former member Craig Couzens and his wife Maggie for their gift over time of $10,000 to Australian Rotary Health. 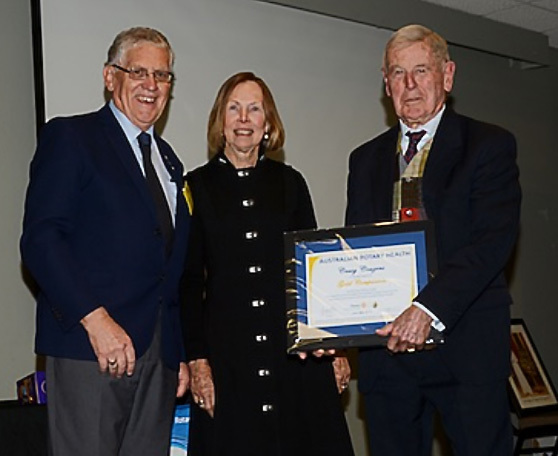 They were made Gold Companions and recognised as the longest continuous contributors to Australian Rotary Health in the whole of Australia..
PP Peter Crozier was awarded Club Rotarian of the Year. Michael Georgiou, not to be outdone, told the fateful story of a man, his mother in law and a fear of religious revisiting.At the same time he donated a large sum towards the work of Wollundry as at the moment he feels he cannot contribute physically. A very generous gesture. The night saw the awarding of two Paul Harris Saphire Pins, one to Doug Conkey and the other to John Egan. These were awarded by the Foundation for their support over the last several years. Attendance was another item. Paul Milde, David Benn, David Pyke, James Ross, James Hamilton, Neil Pinto , Michael Georgiou and David Byfield all had full attendances recorded.. David is 100% for every year of his membership. He was inducted to Wollundry on the very first Changeover. 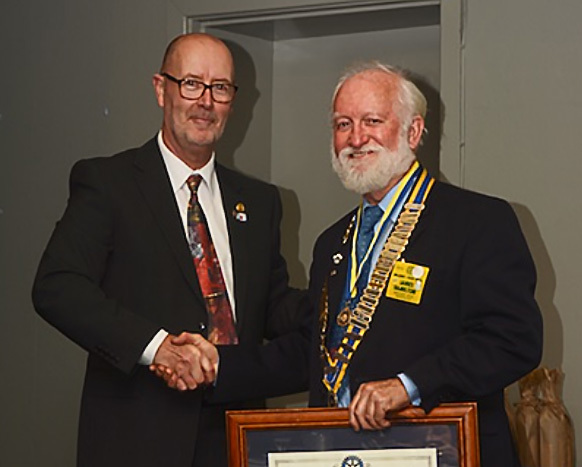 Last night Phil Burgess became the second person inducted at a Wollundry Changeover. Congratulations to all and a warm welcome to Phil. PP Paul handed out Certificates of Appreciation to several hardworking members of the Club. These went to PP Michael Knight, PP Phil Macintosh, John Smith and PP David Byfield. He also recognised the Bulletin Editors, PP Michael Knight, PP Paul Murray, Peter McKinnon , PP Doug Sutton and PP John Egan. Each received a nice bottle of red. All of this was to the background slideshow that Paul Murray set up from his own and collected images. President James then took over procedings and thanked PP Paul for his work through the year, then introduced his new Board. This fine body includes: James Ross (Secretary) ,Aidrian Whiting (Treasurer), David Byfield (Service Proj) Neil Pinto (Youth), Peter Green (Admin), Col Duff (Public Relations),and John Ferguson (Foundation). Paul Milde is Past President, and David Pyke is incoming President. It should be another top year with this balanced management crew. It was a very good night with plenty of fellowship and friendship, as Rotary should be. Chairman PP John Gray did an excellent job.